I harvested my hops this week. I’ve got three hop vines crawling over the stables, where they’re battling for supremacy with the grafted passionfruit vine, but only two have flowered (perhaps the other vine is a male?). My entire harvest came to half a bucket, which weighed in at just 100g. (Hop flowers are as light as air!) But 100g is enough to make 10 litres of home-brewed beer, so I’ve been boiling them up in a big pot of water to extract all their flavour. The smell is just incredible. And as hops are a natural sedative, I bet I’m going to sleep well tonight. I wonder if you did sleep well? I remember that smell from when we brewed beer way back, in the 70’s! Loved it. Can’t remember if I slept well, though. I fancy draping hop vines along the verandah but guess I’d need to live in Nelson to do that. Do they still grow hops in Nelson? Sure did. The smell was overpowering by the time I’d boiled them for half an hour though – I had to open the windows. 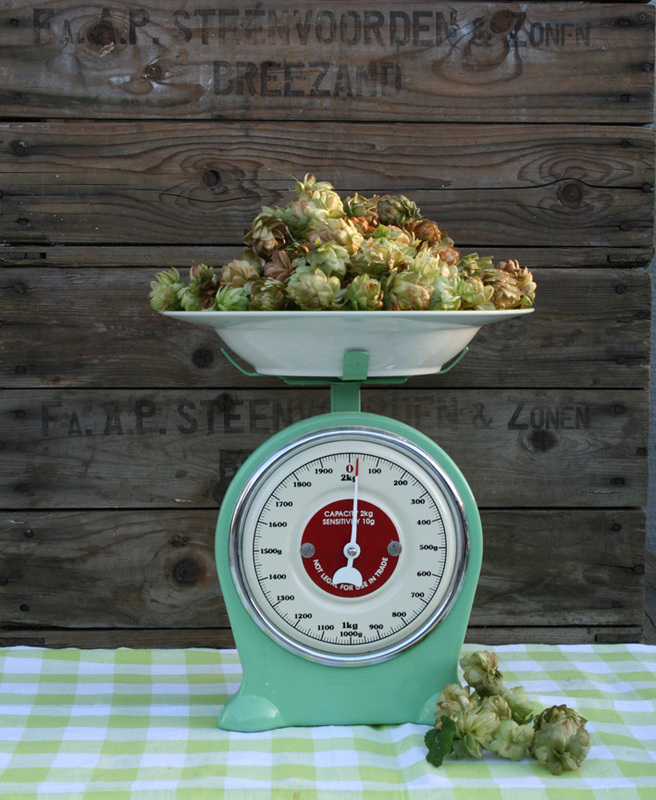 Hops are still grown commercially around Nelson. They’d be fine for you too. I’ve had more luck with them here in Hunua than I ever had in Auckland. I think they must like frosty winters. Well, I hadn’t thought to grow them myself! Will need to source them. But then……where to plant? So as not to be in the way of the “cowman-gardener” with his roundupping and mowing. Where there’s a will there’s a way. I’m glad you like the smell of hops! I don’t. When I was about 2 (67 years ago) my mother and some other hop pickers put me in a hop bag and I can remember a lot of women thinking it was hilarious that I was screaming as they emptied their pickings on to me. I don’t exactly panic when i smell hops but I do get that Riwaka flashback. I do like a well made home brew though. Perhaps I should grow a vine to desensitize my aversion! Heh. What a lovely (scary) story. There are some brilliant old photos of hop pickers on the Te Ara (Encyclopaedia of New Zealand) website. Two of my favourites are here and here. Thank you, very interesting. I don’t think I featured in either (!!!!) My relies (from 1842 immigrants into Nelson) used to grow both hops and tobacco. My brother and I used to raid our uncle’s tobacco kiln and roll up a dried leaf in newspaper and hide underneath a bridge to smoke. Trouble was that the flame used to rip down the edge of the newspaper and get to our mouths about the time of the first draw was made; so neither of us became nicotine addicts.